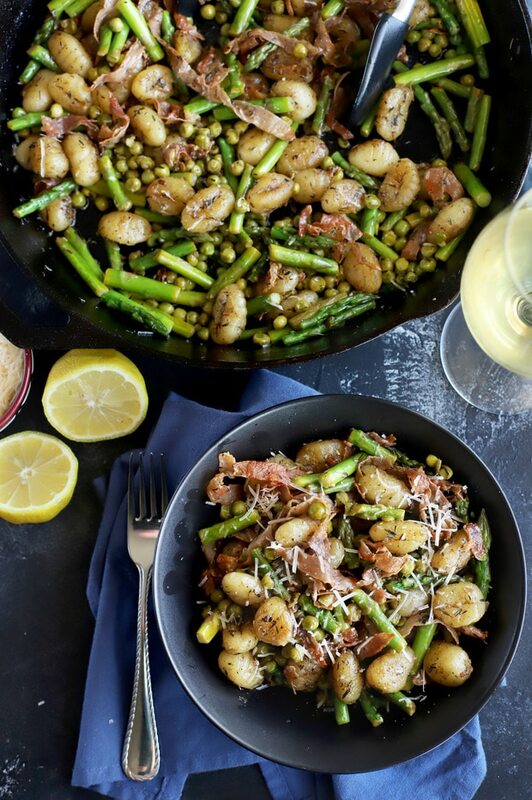 Brown Butter Gnocchi With Asparagus & Peas is a warm and fresh skillet of pure joy. 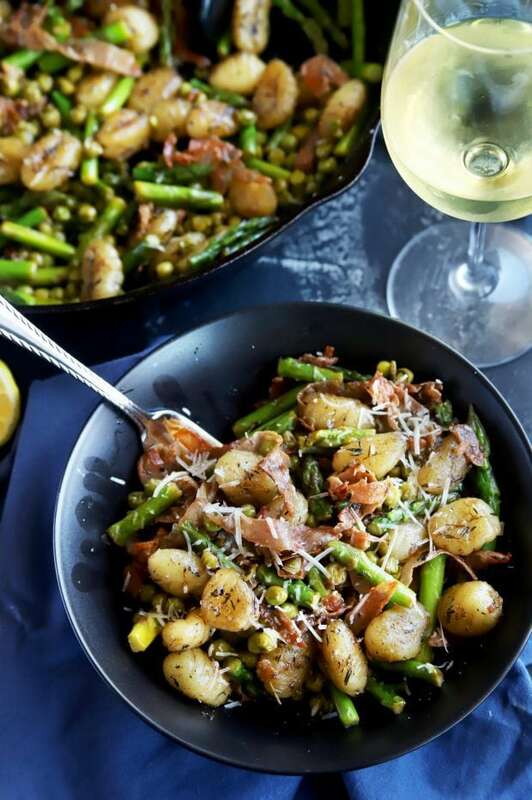 The crisp, green vegetables with soft and pillowy gnocchi are tossed with brown butter and crispy prosciutto. 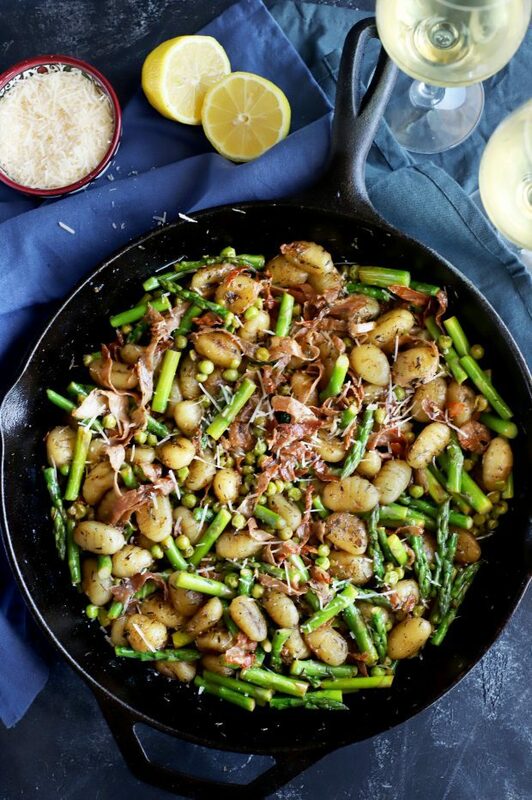 It’s the ideal spring meal that you won’t want to stop making over and over again! Spring is in full swing here, even though the leaves on the trees in our backyard aren’t sprouting just yet. The only sign of spring being here in Colorado is the tulips slowing pushing their way through the dirt and the warm weather. I’m unbelievably ecstatic about it because I have missed the warm weather (as you’ve heard me go on and on and on about these past several months). Finally I can pop out back after I finish up with the dishes, lounge on a chair while listening to an audiobook, and sip on a glass of crisp white wine as the dogs run around. It’s one of those little joys that I cherish during the warmer months, just like the additional hours of sunlight and the sunroof in my car. 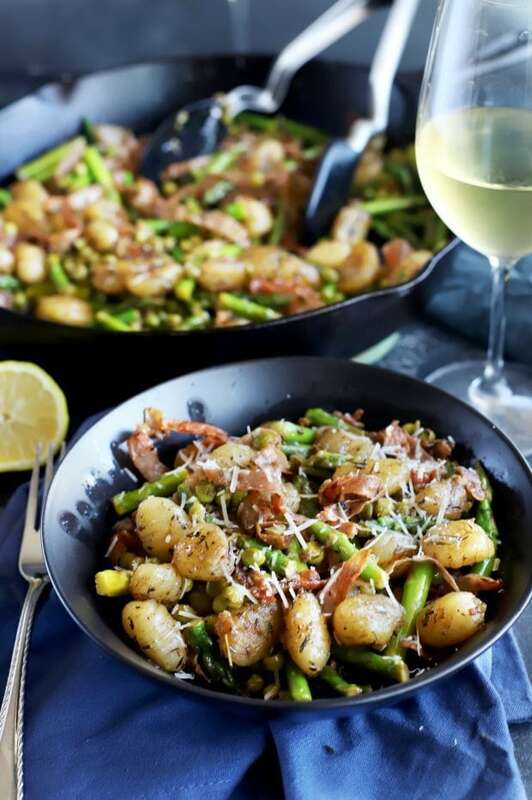 This brown butter gnocchi skillet is my new favorite way to indulge in gnocchi. It’s full of all the spring things that I absolutely love! 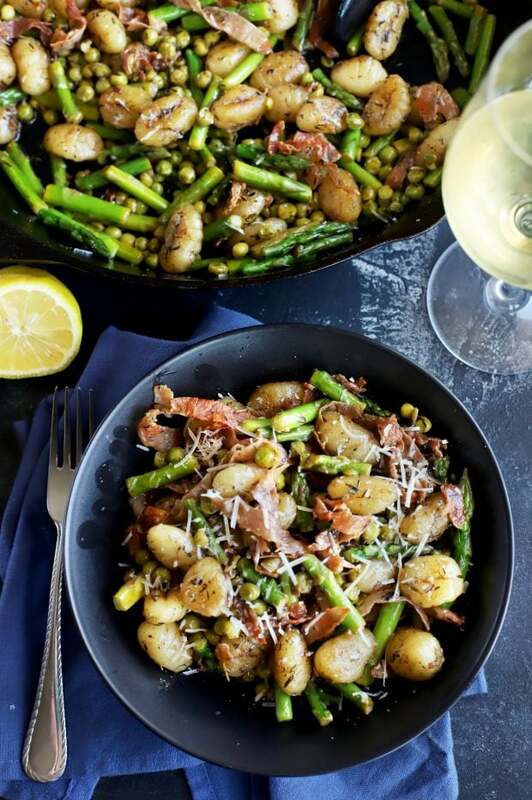 From the asparagus and peas, to lemon and parmesan, each bowl of this gnocchi is a mixture of happiness. 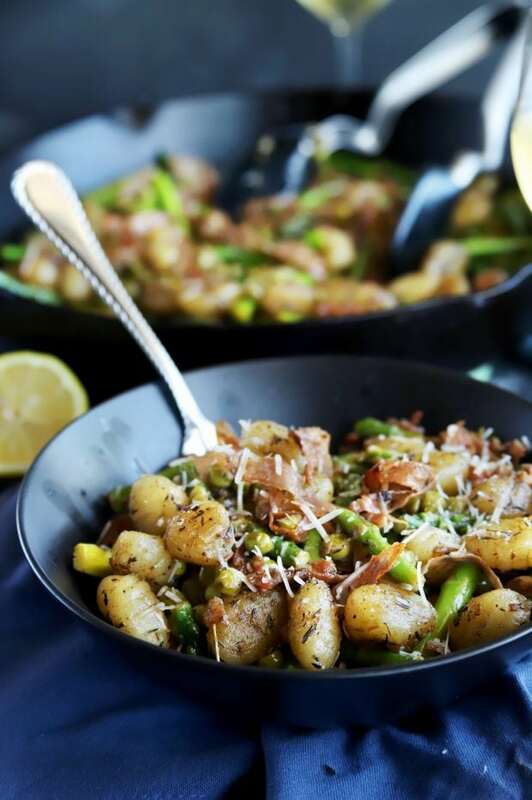 The crispy prosciutto provides an added texture for the pillowy gnocchi. Finally, there’s the brown butter sauce that brings it all together with richness and nutty notes. GAH, I could literally eat this pasta every single night. 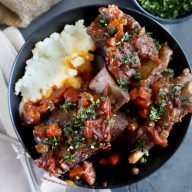 There’s just so many elements in the skillet, but they all pair together in the absolute best way. It’s SO stupidly simple to make, so you can whip it up on a weeknight. 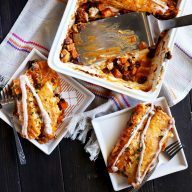 However, it makes such a big “wowza” impact, you can also serve it up at your next dinner party! 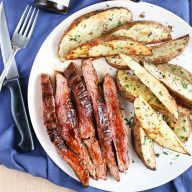 You will definitely need a cast iron skillet to make this recipe shine. I love it because it serves as a single dish to cook in and serve out of, while also looking great! 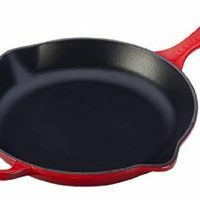 If you want a cheaper skillet, you can opt for this Lodge cast iron skillet that is also durable and long lasting. 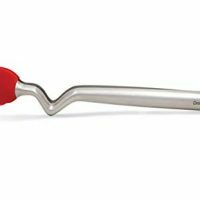 I love my clongs (AKA click-lock tongs) because they have this little stand that lets you set them on the counter without making your counter all messy! It’s ideal for tossing pasta dishes like this, as well as serving. 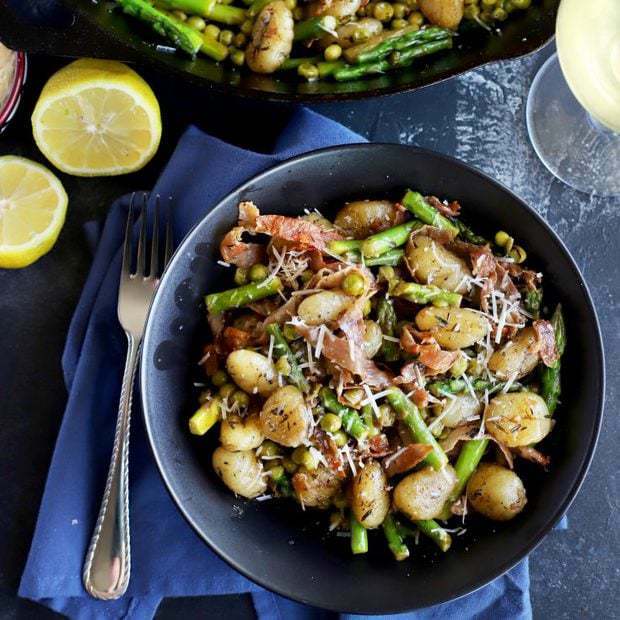 Make sure that you have a sturdy chef’s knife and cutting board to cut up the prosciutto and asparagus. 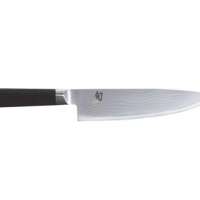 It’s all about getting those even knife cuts after all (at least that’s what Gordon Ramsey would say). 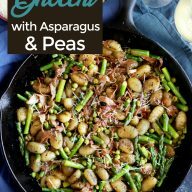 Pin this Brown Butter Gnocchi With Asparagus & Peas recipe for later! 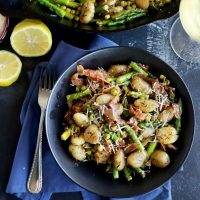 Gnocchi, asparagus, and peas are tossed with a rich brown butter sauce, lemon, and crispy prosciutto for the ultimate spring dinner! Heat a 12-inch cast iron skillet over medium-high heat. Add prosciutto to the skillet and cook until crispy, stirring occasionally, about 2 minutes. 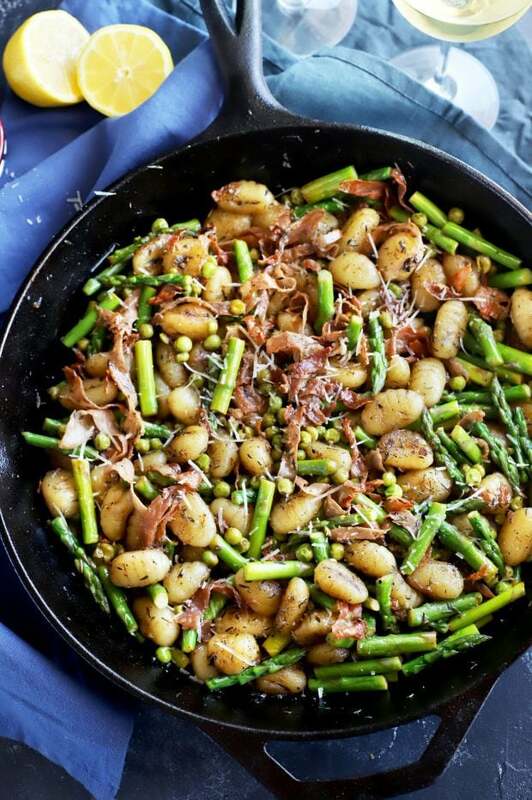 Remove prosciutto from skillet and set aside. Add 1/4 cup butter to the same skillet. Let over medium heat and continue to cook for about 2 to 3 minutes, stirring constantly. Once the butter is brown and smells nutty, remove from heat to a small bowl. Add remaining butter and melt. Add gnocchi and cook over medium heat in the skillet until browned, about 5 minutes. Stir in garlic and thyme leaves, cooking until fragrant, about 1 minute. 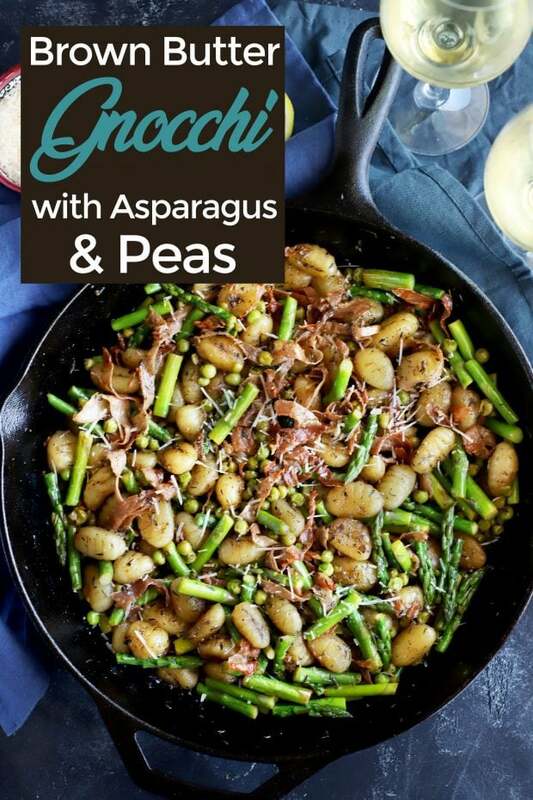 Stir in salt, pepper, peas, and asparagus, along with half of the brown butter. 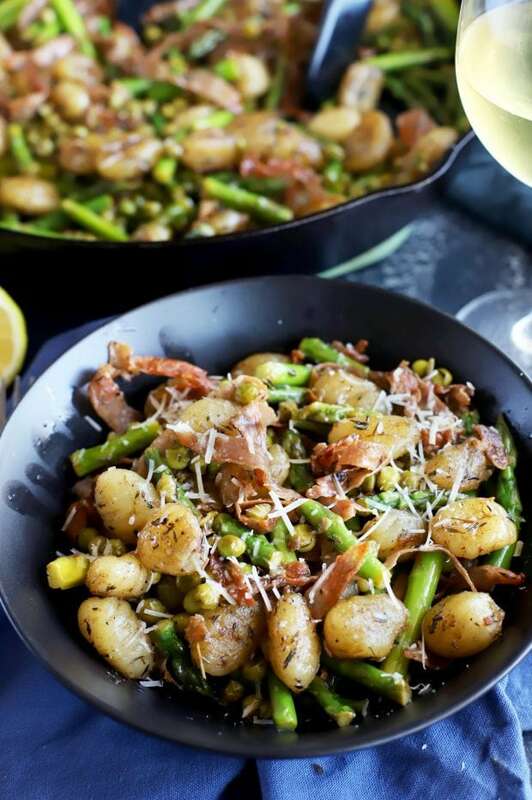 Cook until vegetables are bright green and cooked through. This will take about 2 to 3 minutes. Stir in remaining brown butter and lemon juice, cooking until fragrant, about 1 minute. Serve immediately with remaining parmesan cheese.